While brainstorming on what to post today I decided it was time again for some of my random inspirations. I liked making the previous one. 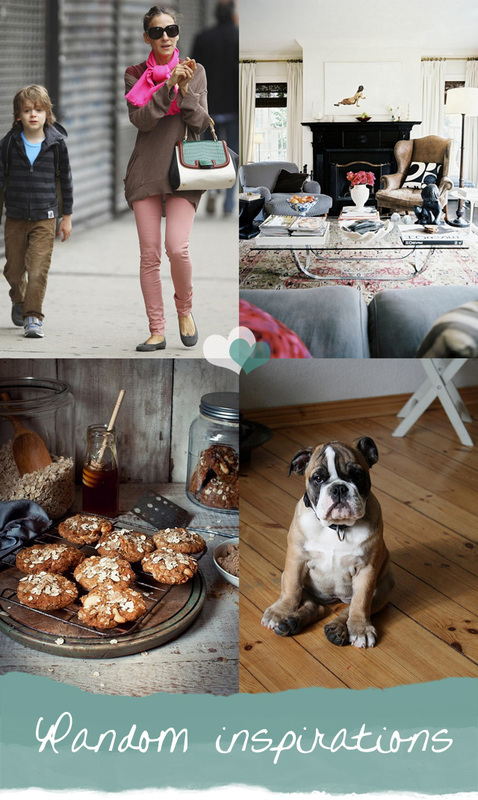 The images below make me think about wanting to wear that fabulous, nonchalant outfit from Sarah Jessica Parker, read a book in that beautiful, comfortable living room, bake delicious cookies for a great nostalgic feeling and cuddle with the most irresistible bulldog boxer (puppy). But since none of these are possible and the first official eve of Summer feels nothing like it I'm going to end this night watching One Three Hill instead. I very much enjoy that too;) Tell me, what are your favorite random inspirations or best alternatives for them? You did make them by yourself. I love the randomness of this! Gorgeous. Random, but it all looks great together! SJP always looks great, doesn't she? A great post of randomness...love the living room - cozy!! your blog is a inspiration for me!!! love all the images and when does SJP not look spectacular? that dog just stole my heart! Love these randoms, they play together perfectly. Just found you through the comments on Bohemian Twilight (Into the Mystic!). Your blog is lovely, and that puppy - too cute!! Loving the SJP picture! The grey shoes, with soft pink pants, all topped by the shocking pink scarf is a dreamy combo. Love SJP and that darling pup!!! I find inspiration everywhere around me. The garden, what someone is wearing, a store window, a magazine. So much beauty around us!!! I love all those ramdom inspiration, they're all beautiful and they remind me of these long days that I love, just standing near the sea with Nala, my yorkie. I like your blog so much, you have a great sense of style and clothes. I indeed love your pictures of the living rooms and houses, with those sofas and that atmosphere so magical. You transform reality into art. Thanks.